We’d love your help. 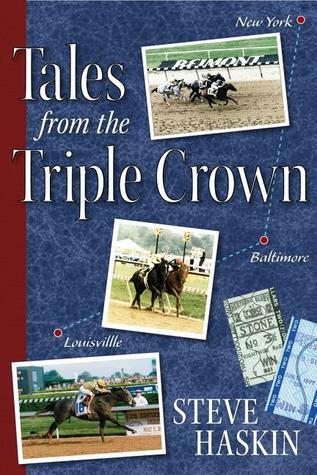 Let us know what’s wrong with this preview of Tales from the Triple Crown by Steve Haskin. Steve Haskin takes readers behind the scenes to introduce them to the trainers, jockeys, and horses seeking the worlds most elusive sports prizethe Triple Crown. Haskins personal involvement, keen eye for a good story, and conversational writing style make readers feel like they are living the moment with him. To ask other readers questions about Tales from the Triple Crown, please sign up. The majority of these stories are not of the same caliber of Haskin’s current column for the Bloodhorse but are interesting particularly if you know racing going back to Spectacular Bid’s days. Horse racing is not as popular as it used to be. You have a flurry of publicity around the Triple Crown, and a lesser blip from the Breeders' Cup in the fall, and that's pretty much it. The last horse people outside the industry really rallied around was Zenyatta, the great mare of a few years back. (She was even the subject of a profile on 60 Minutes.) Of course, there's always the hard-core fans who like to throw away their money, but I don't do that; I follow the sport for the horses and the Horse racing is not as popular as it used to be. You have a flurry of publicity around the Triple Crown, and a lesser blip from the Breeders' Cup in the fall, and that's pretty much it. The last horse people outside the industry really rallied around was Zenyatta, the great mare of a few years back. (She was even the subject of a profile on 60 Minutes.) Of course, there's always the hard-core fans who like to throw away their money, but I don't do that; I follow the sport for the horses and the people behind them. This book, therefore, seems like it would be right up my alley. Steve Haskin is one of my favorite writers for The Blood-Horse, and his column, Hangin' With Haskin, is a must-read. So why, though I enjoyed parts of this book, did it ultimately come off as unsatisfying? It isn't because of Haskin's skills as a writer; I've read plenty of wonderful pieces by him. The very first article in this book, "The One and Only Spectacular Bid," is one such. Most of the book's other chapters concentrate on more recent horses from the nineties and oughts. Thinking about this, though, made me realize why this book ultimately didn't do it for me: its subjects. With a few exceptions, such as Zenyatta, today's Thoroughbreds don't hold a candle to the ones in the past. Spectacular Bid on his worst day could beat any Kentucky Derby winner of recent vintage. My two favorite horse racing books are Laura Hillenbrand's Seabiscuit and Bill Nack's Secretariat. These are two wonderfully written books that you should definitely read, but their subjects made them so; their stories are ones you just don't find nowadays. What a fantastic set of stories mostly from the1990's Triple Crown trail. I wasn't following racing closely in that era so it was great to catch up. Steve Haskin is a master of small details and intimate stories as well as putting the horses, the people and the races into a larger context. Bravo. It's hard to find these days so I'm glad I picked up the slightly battered copy I found at Belmont Park.